September was a busy month for us and I wasn't able to share some of the photos because the following months we went cruising to Bahamas then, back to Alabama by December. I only got back into blogging by January, lo and behold, it's now February! Wheww... and we will be back to Mississippi...again! Anyway, this is the view from our hotel room at the ISLE of Biloxi. We have a balcony and we truly enjoyed the view because the land mass across is the city of Ocean Springs. 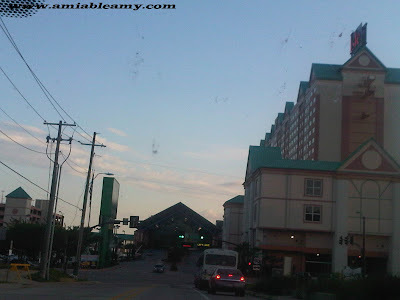 We lived there for 18 months and every day, I saw the Isle Hotel and Casino stood gallantly across the waters. We like our room because the view of the bay and the Gulf was breathtaking especially at sunrise. This is the Bay Bridge that connects the cities of Biloxi and Ocean Springs along the highway 90. On this day, I woke up early to catch the glimpse of sunrise. It was foggy and a little chilly but, it was a gorgeous day. This is the room and the area is a good size with free WiFi. I always like to have twin beds because I work late at night and I can have all the space I needed without waking up my husband. 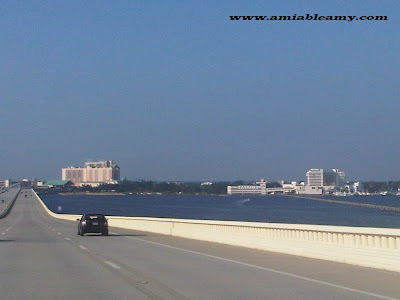 The picture above is taken from the Bay Bridge as we drove towards the huge building of the Isle Hotel and Casino. This month we will be coming back to Mississippi and stay at the Isle for the Mardi Gras celebration at the Gulf Coast. I will be posting more pictures soon. Thanks for stopping by. Ams, pang-Tuesday Travels kaayo ni nga post! ;-) Beautiful shots!